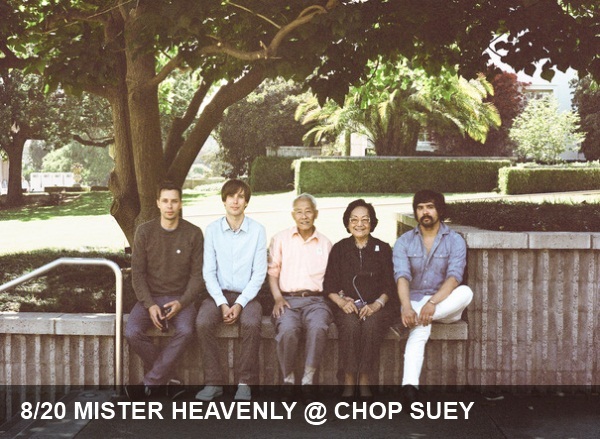 Sure Mister Heavenly is known as supergroup (bringing together past and present greats including The Unicorns, Man Man and Modest Mouse) and has been known to call on the bass-playing talents of the less socially awkward version of Jesse Eisenberg, but what really gets us excited is the band’s predictably strange lyrics and energetic vocal interplay between dueling singers. While we’ve been fans of the vast majority of bands that predated and coexist with Mister Heavenly, the latest project that brings together Nick Thorburn (The Unicorns, Islands), Honus Honus (Man Man) and Joe Plummer (Modest Mouse) adds a playful interplay that pleasantly recalls Thorburn + (fellow Unicorn) Alden Penner dynamic of the early 2000s. Many years from each musicians’ stage debut, expect to hear a group that’s been refining its craft over thousands of performances. Watch the full album stream video below now and head to Chop Suey tonight to take in the live experience for yourself.